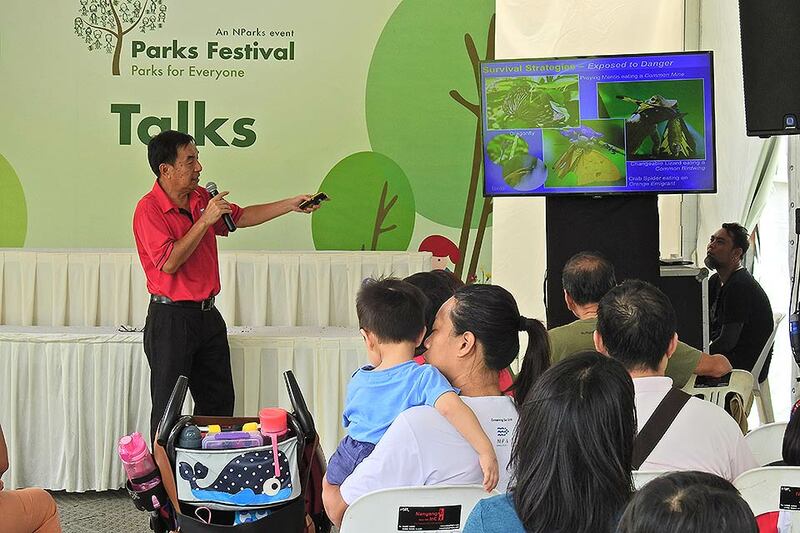 Last weekend, the National Parks Board, Singapore held its Parks Festival : Parks for Everyone at the Bishan-Ang Mo Kio Park. Featuring a wide range of programmes and activities spread over two days, the festival aimed to get the public outdoors into the park to enjoy themselves. 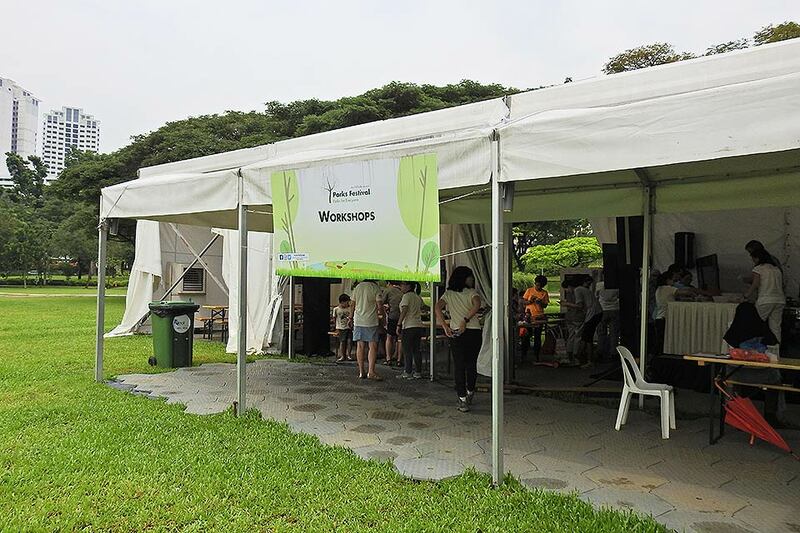 There were exhibitions, workshops, educational talks, artists' handiworks and even a musical concert showcasing local talent! 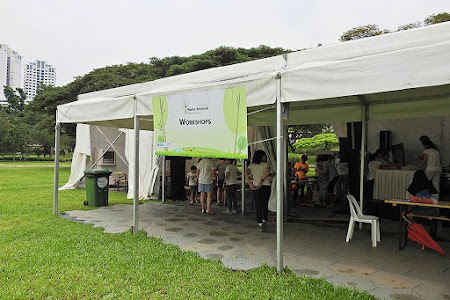 The activities were grouped into 5 main categories - Entertainment, Guided Tours, Sports and Wellness Activities, Talks and Workshops, and Volunteer Programmes, Courses and Exhibitions. 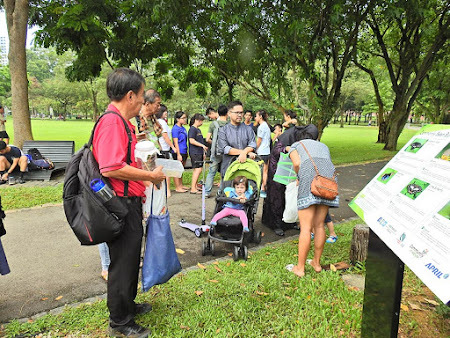 A timetable of the events over the two days was prominently displayed at Bishan-AMK Park so that the public can pick and choose what interests them. The activities and mini-exhibition stalls were housed under large marquees at the open green areas at Bishan-AMK Park, so that visitors can still enjoy themselves, rain or shine. Despite the not-too-cooperative weather at this time of the year, the weekend crowd was out and about at Bishan-AMK Park and there was reasonably enthusiastic interest in the programmes and activities throughout the day. The plant workshops were well attended, as visitors were treated to a whole range of show-and-tell from wood carving to growing bananas to cultivating air plants. 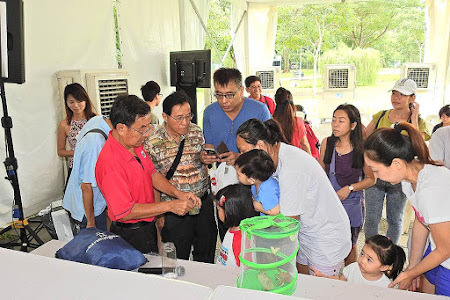 On Sunday afternoon, I went to support Mr Foo Jit Leang who founded the nature group from Seletar Country Club. 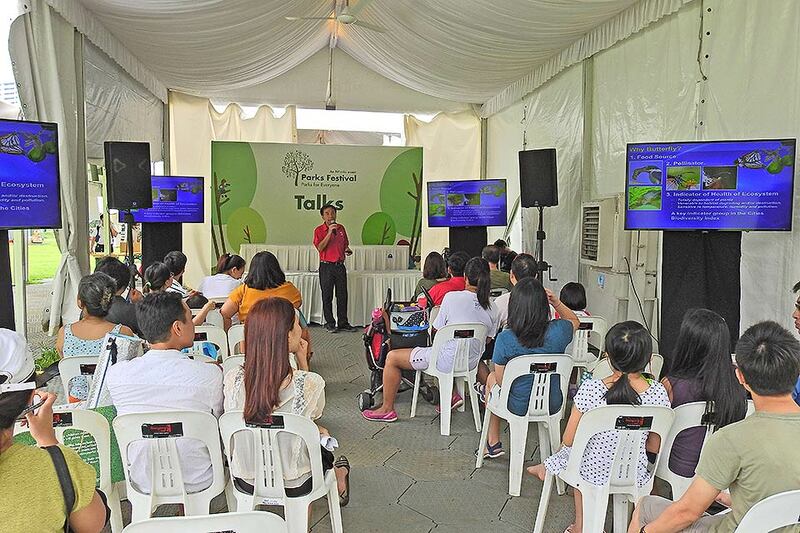 He was giving a talk on "Planting for Butterflies" where he was sharing his knowledge on butterflies and planting to attract them. Mr Foo's Butterfly Garden at the Seletar Country Club recently won Platinum for Environment and Biodiversity at the 2016 Community in Bloom Awards. 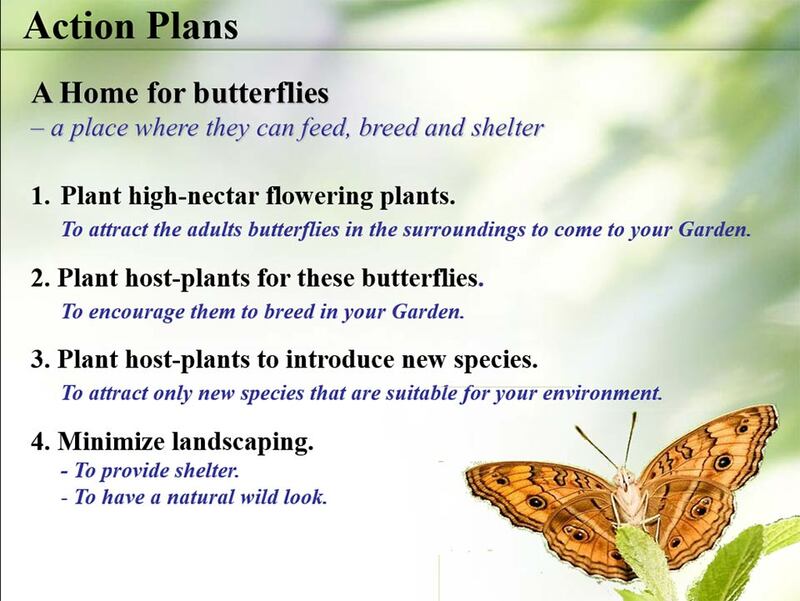 He also went on to offer his advice to several other award-winning butterfly gardens in schools. 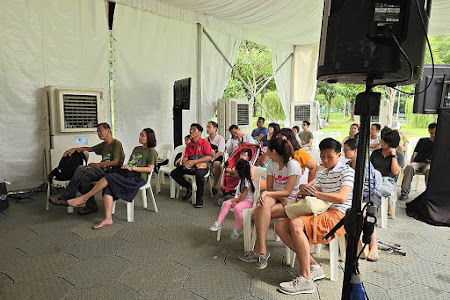 A small group of enthusiasts turned up for Mr Foo's talk despite some members of the audience who turned up slightly late because they could not find the venue where the talk was held! After a slight delay, Mr Foo started his talk by introducing butterflies, their biology and ecological features and other interesting anecdotes. 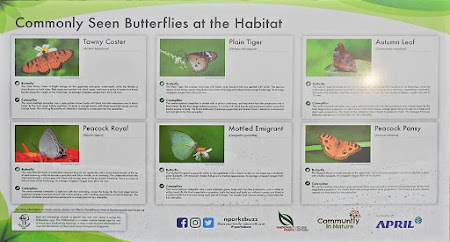 He shared his experience about caterpillars of both butterflies and moths, and how to plant the appropriate species of plants to attract certain species of butterflies. 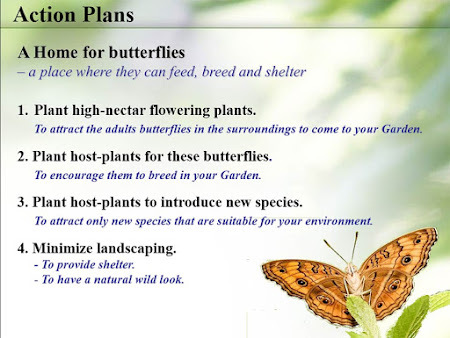 In a cultivated urban garden, it is important to plant the right species of plants to attract the butterflies whose caterpillars feed on those specific plants. Gardeners should be aware that butterfly caterpillars do not eat anything and everything (a common misconception). 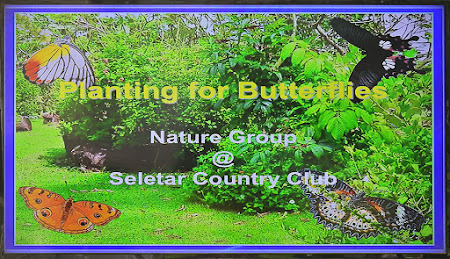 Mr Foo's presentation showcased many colourful slides of plants, caterpillars and butterflies that he has managed to attract to the Butterfly Garden at Seletar Country Club. 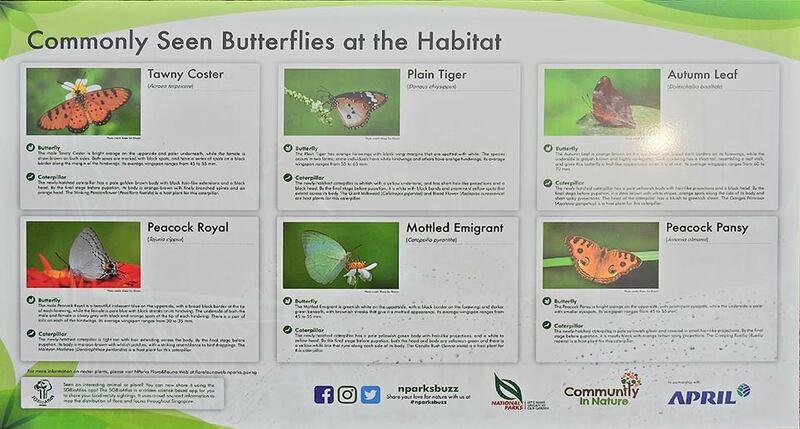 The total number of species that have been spotted at the Butterfly Garden currently stands at 109 - an impressive number for a garden within an "environmentally-unfriendly" golf course in Singapore! Live caterpillars and pupae always attract the kids and fascinate everyone! 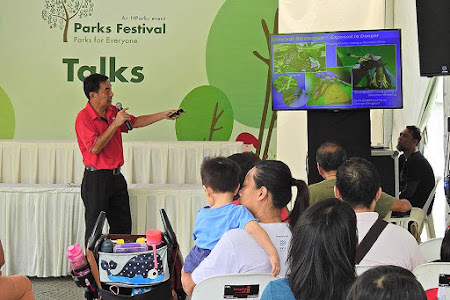 At the end of his talk, Mr Foo brought out the "live stars" of the show - caterpillars of various species of butterflies. 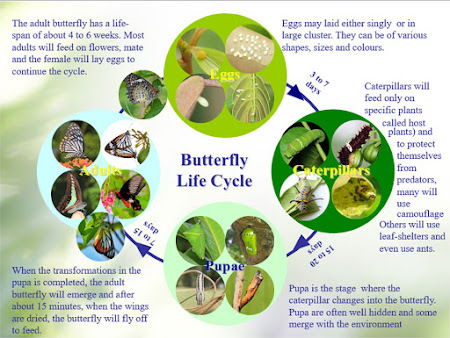 The kids at the talk were fascinated by the different shapes and sizes of the caterpillars and pupae that were shown to them. 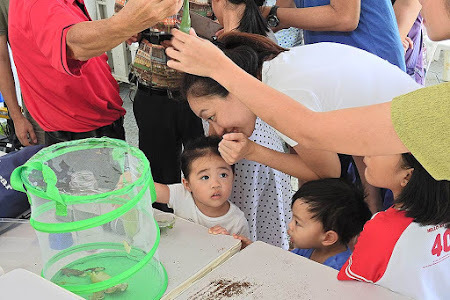 There were also many enthusiasts amongst the audience who were very keen on breeding caterpillars. The group then took a walk to the Butterfly Habitat @ Bishan-AMK Park. 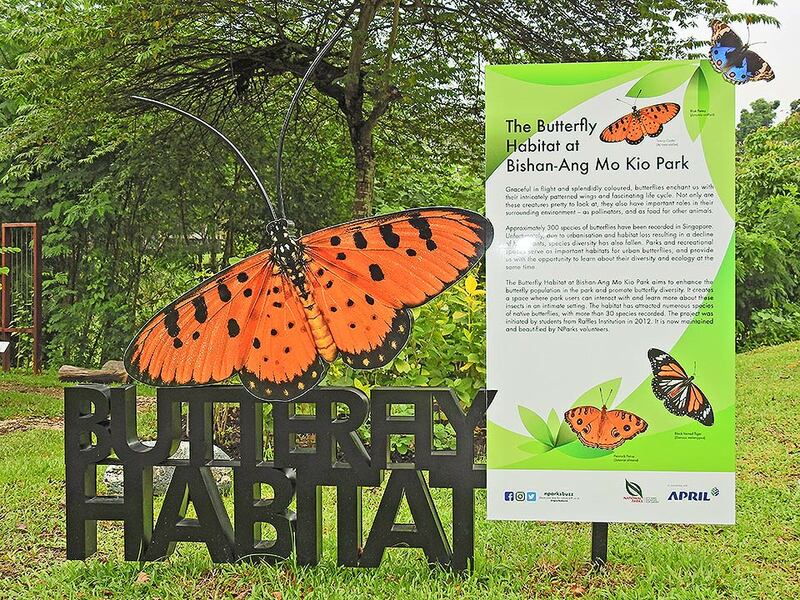 This compact butterfly garden was started some years back by a group of Raffles Institution students and their initial work was continued by a group of community gardeners and enthusiasts, working with NParks to bring this butterfly garden to its current state. The lush plants - both nectaring and host, have attracted a number of butterflies to the garden. NParks has also secured an external sponsor to fund additional permanent interpretative signage to introduce visitors to the Butterfly Habitat. 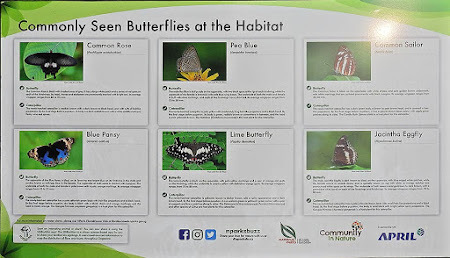 The signages depict pictures and information on the plants and butterflies that can be found at the Butterfly Habitat so that visitors can be educated on the biodiversity that they encounter at the garden. So if you're planning on starting a butterfly garden in your school or community park, do contact Mr Foo or join his FaceBook Group - Nature @ Seletar Country Club. 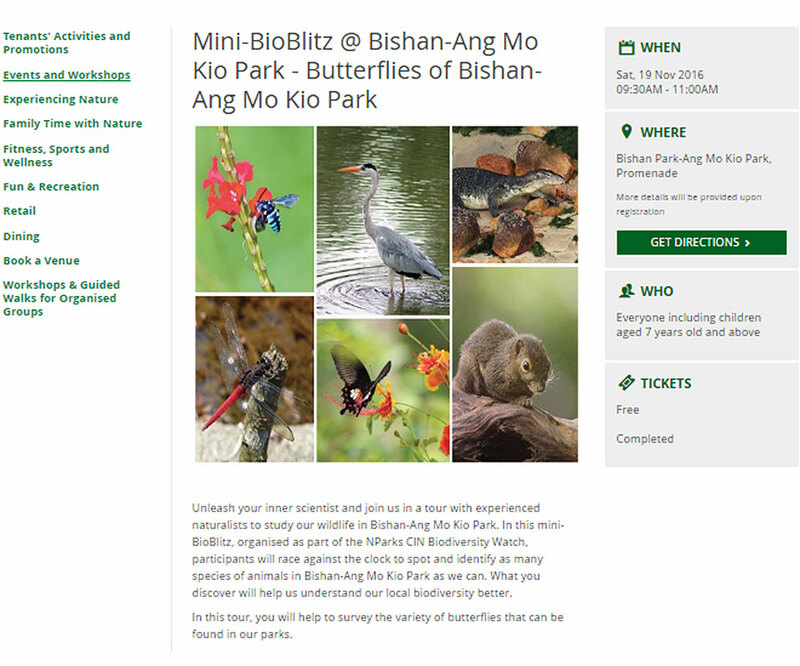 NParks, ButterflyCircle, Seletar Country Club hope to encourage more enthusiasts to set up butterfly gardens all over Singapore, so that our urban biodiversity can be conserved and enhanced for more residents to appreciate them. Our 8th instalment of Butterflies' Favourite nectaring plants features another invasive "weed" that is common in disturbed or cleared sites in Singapore. 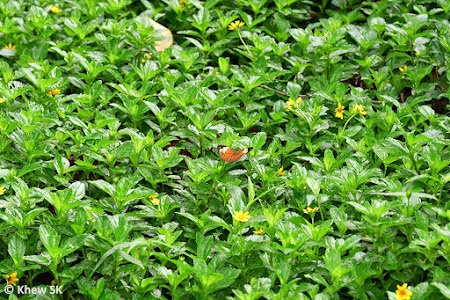 It is used by landscape designers and gardeners as a ground cover or a 'filler' plant in cultivated gardens. 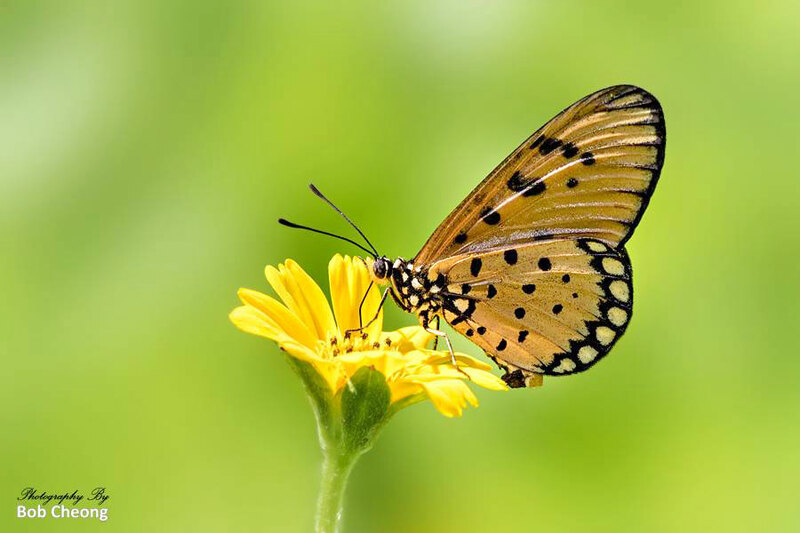 The pretty yellow flowers that dot a mat of deep green ground cover give a certain amount of aesthetic appeal in garden settings. 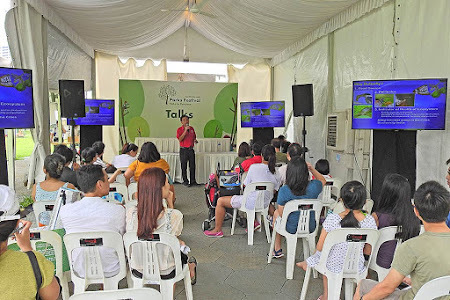 The plant has a number of English common names, but is often referred to as the "Singapore Daisy". 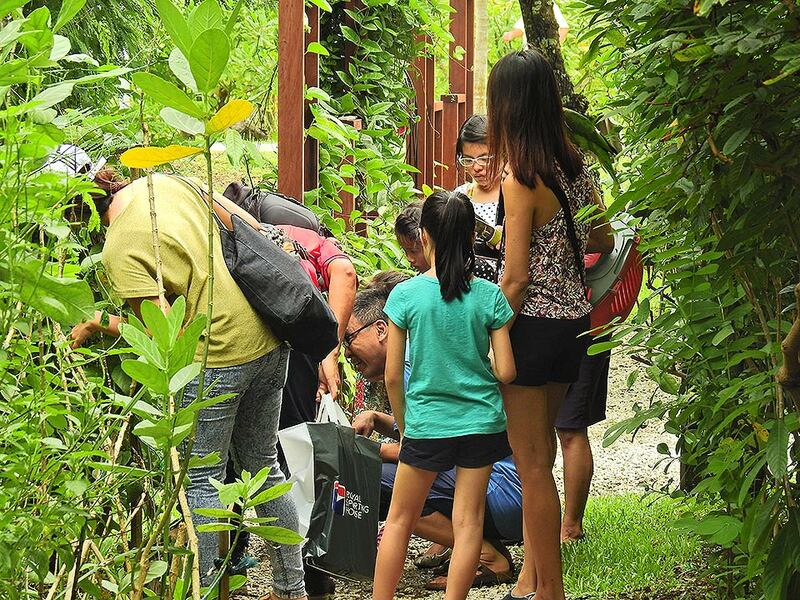 That the name "Singapore" is associated with an invasive plant and often unwelcomed weed is indeed curious! 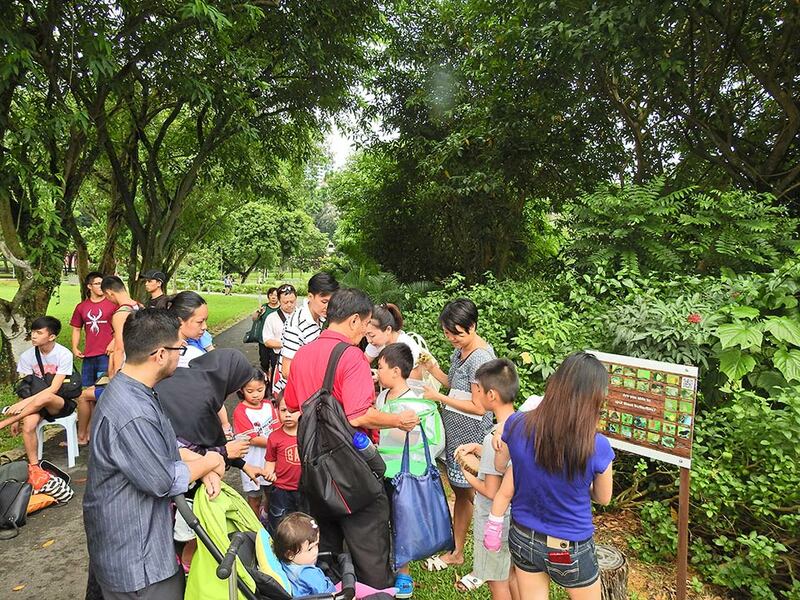 This is especially more so, when the plant is not even a native of Singapore nor Southeast Asia, but originated from tropical America, Mexico and the Caribbean! 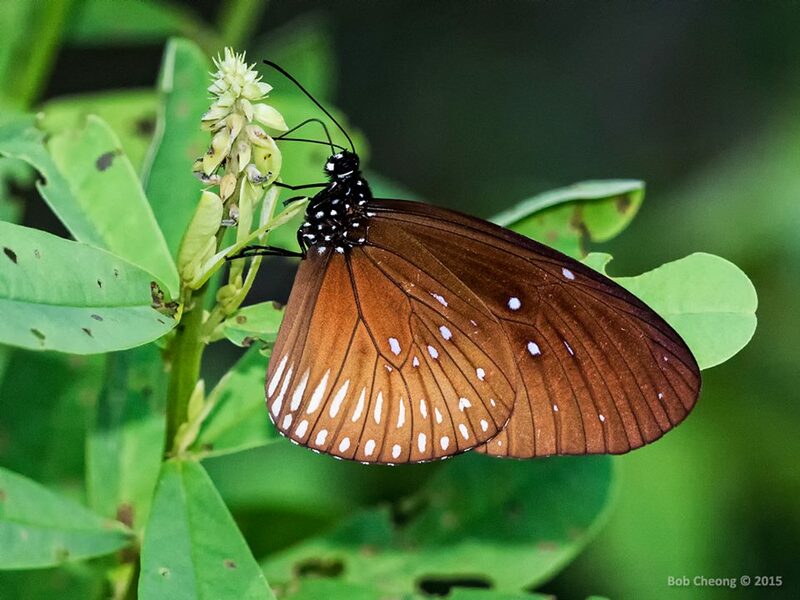 Sphagneticola trilobata is listed in the IUCN's “List of the world's 100 worst invasive species”. 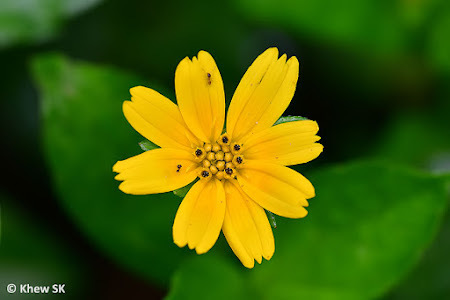 In Queensland, Australia, for example, the Singapore Daisy is a restricted invasive plant under the Biosecurity Act 2014. 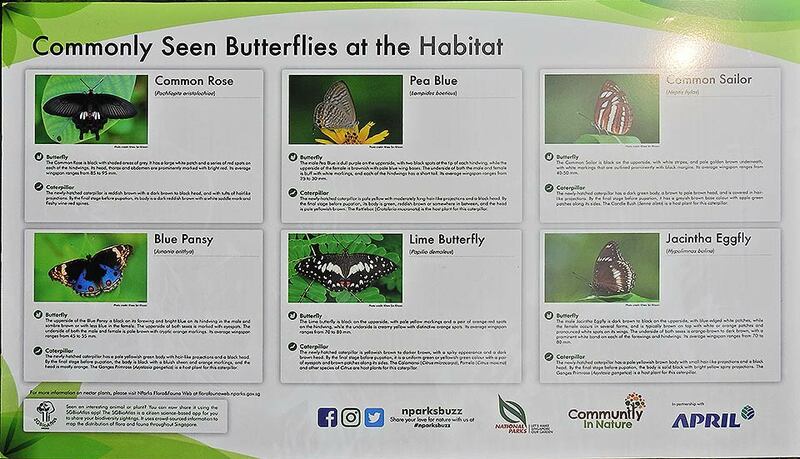 It must not be given away, sold, or released into the environment without a permit. 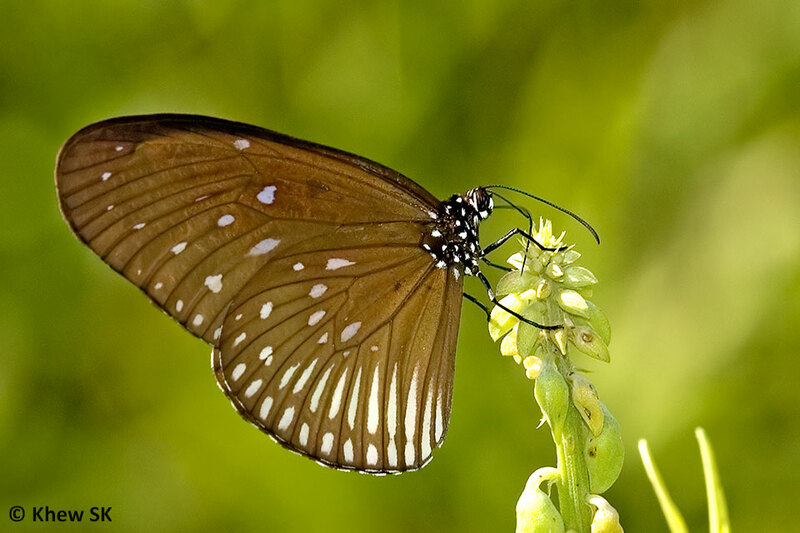 It is widespread as an invasive species on the Pacific Islands, Hong Kong, South Africa, Australia, Indonesia, and Sri Lanka. 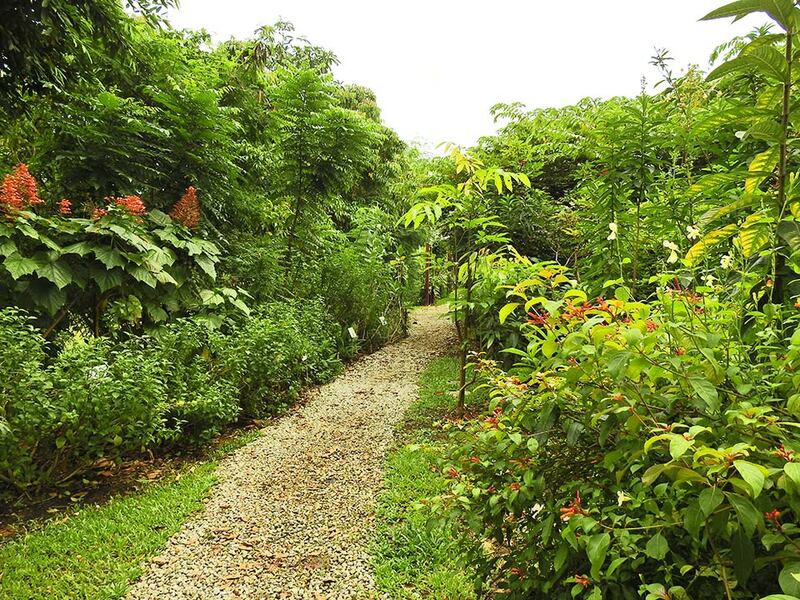 Country of Origin : Tropical America - native to Mexico, Central America, and the Caribbean, but now grows throughout the Neotropics. Status : Exotic; Naturalised. Cultivated. 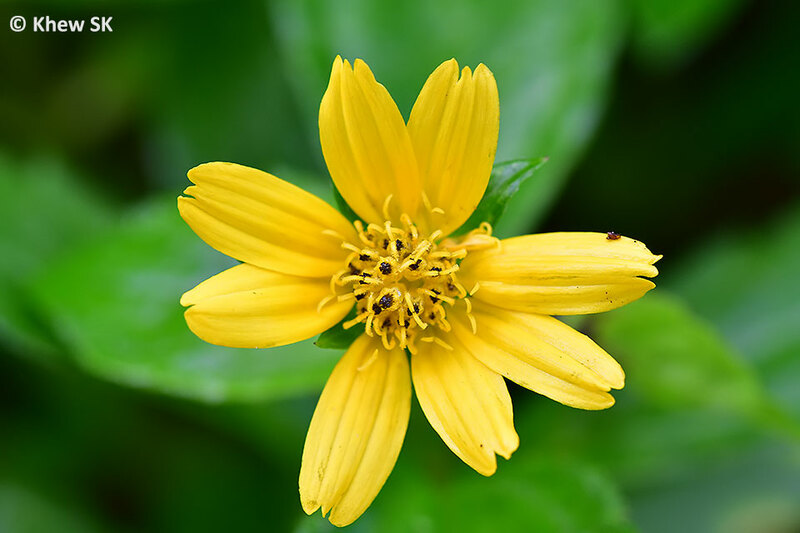 The Singapore Daisy is a perennial herb with a creeping, scrambling or climbing habit, growing up to 30 cm tall and 4 m long. 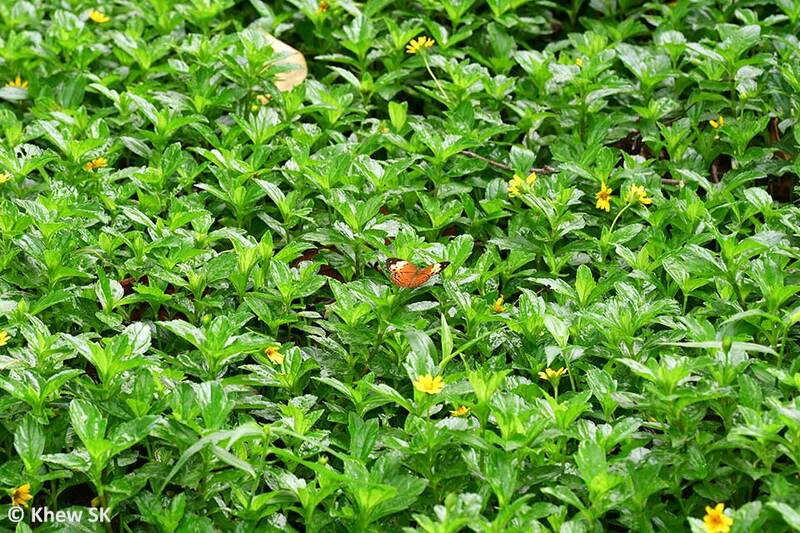 This mat-forming plant is often cultivated as an ornamental dense ground cover. 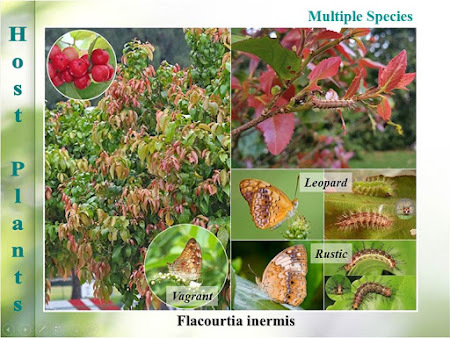 It may also climb a short distance up trees or over other vegetation and is known to crowd out and displace other species of plants in its way. 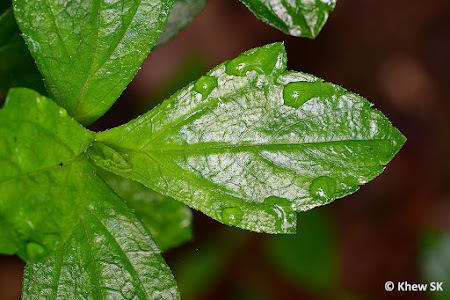 The leaves are simple, opposite, sessile or borne on very short petioles, slightly fleshy, mostly hairless, glossy, 4-9 cm long and 2-5 cm wide. 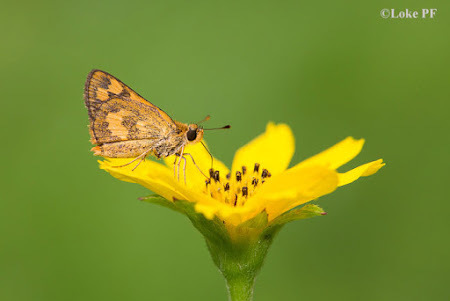 The species name trilobata - three-lobed, referring to the 3-lobed lamina with irregularly toothed margins . Colour of the leaves is dark green above, paler below. The stems of the Singapore Daisy are rounded, solid, green or pinkish-red and are somewhat hairy to almost hairless. 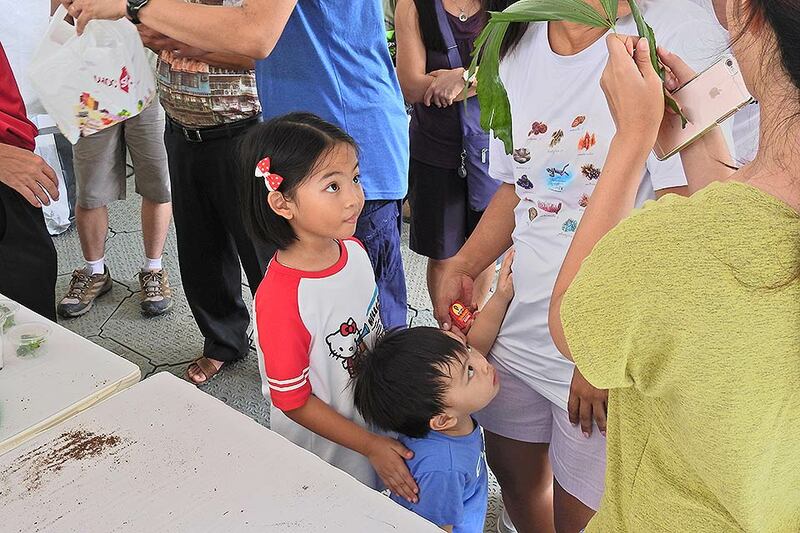 They grow up to 4 m long and regularly develop adventitious roots at their joints. 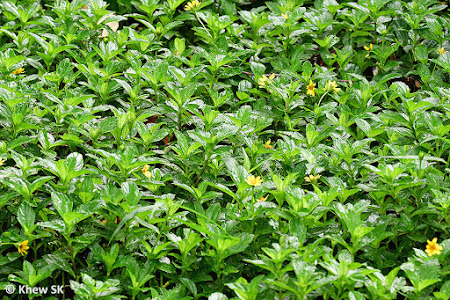 Short, semi-upright flowering branches are produced off these creeping stems. The yellow-orange flower-heads are about 3-4 cm across, and are axillary and terminal, borne singly on an erect stalk ranging from 3-11 cm long. They are composed of 8-13 yellowish petals that are 6-15 mm long with finely toothed tips. 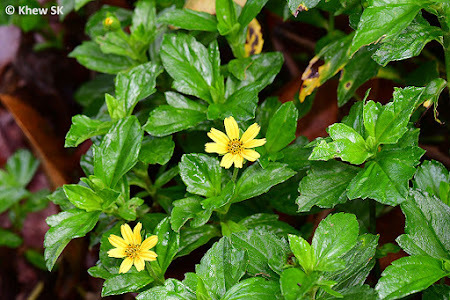 In the centre of these flower-heads, there are numerous tiny yellow tubular florets 4-5 mm long. 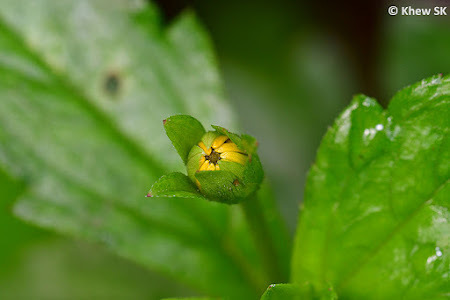 The base of each flower-head is enclosed in a row of narrow green bracts of about 1 cm long. The fruit is a brown, elongated achene, 3-5 mm long, topped with a crown of short irregular scales. 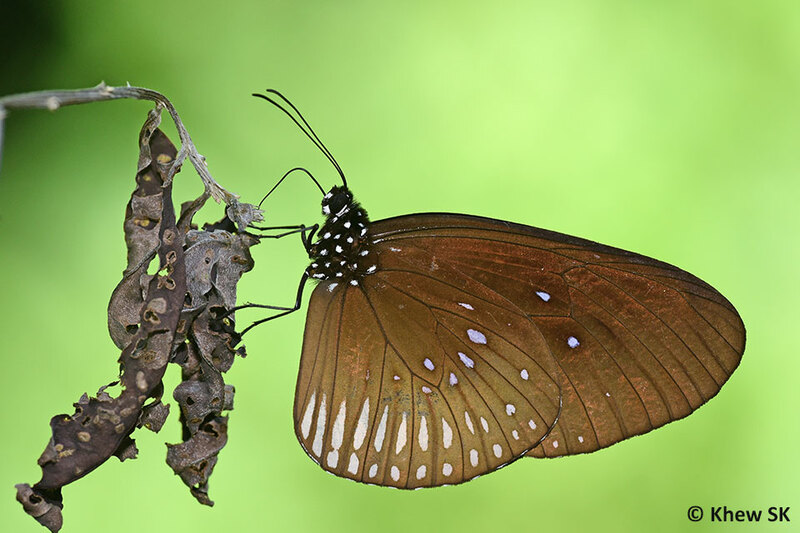 However, viable seeds are rarely produced. The Singapore Daisy reproduces vegetatively by stem fragments. Where the stem nodes touch nutrients, whitish roots will sprout and these will easily grow and spread horizontally across the substrate. 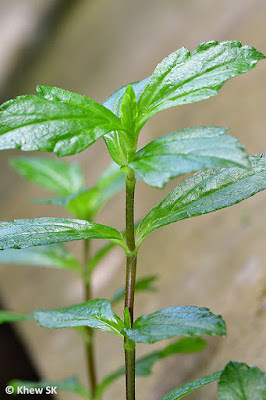 It is easily propagated by stem cuttings and stolons. The Singapore Daisy has a very wide ecological tolerance range and does equally well in both dry and moist sites. 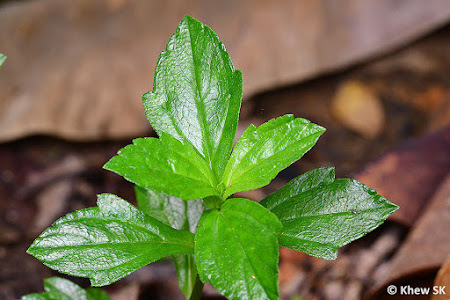 Although it prefers full sun, it can also survive well in shady conditions. 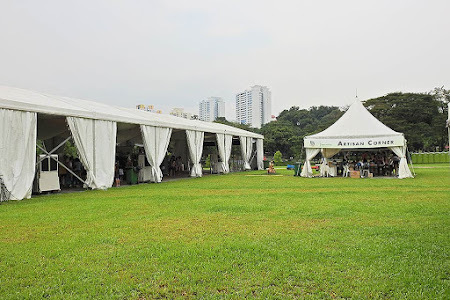 It is very adaptable to wide range of soil types, including nutrient-poor sand, saline soils, swampy or waterlogged areas, and even bare limestone. It is tolerant of dry periods and periodic innundation as well as high levels of salinity. 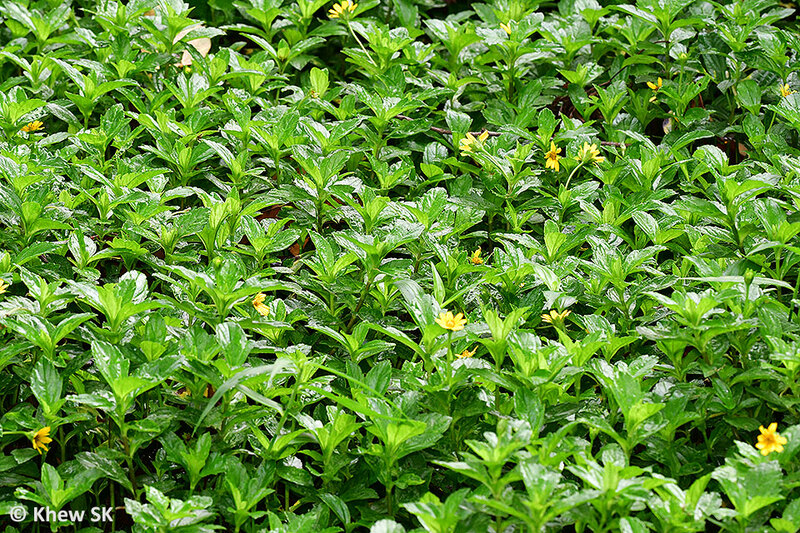 Its fast growth may smother nearby groundcovers, so the plant should be pruned back regularly. The plant is also known for several traditional medicinal uses. 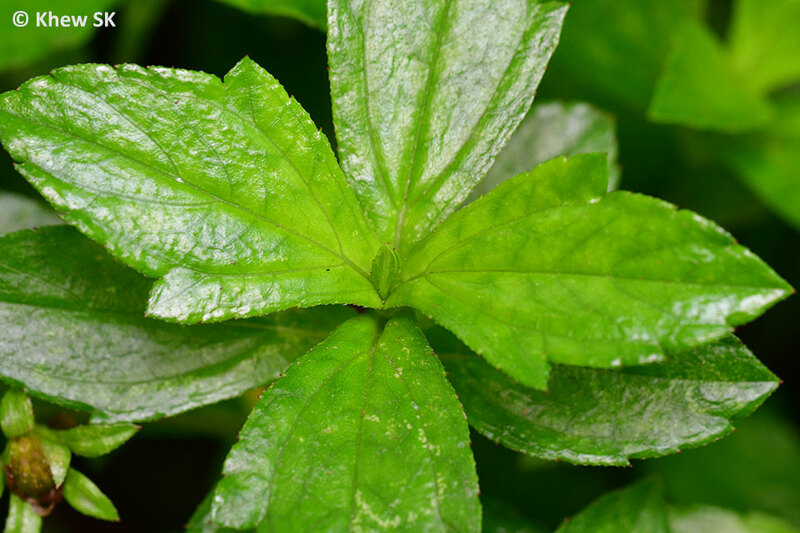 It is used for hepatitis, indigestion due to sluggish liver, white stools, burning in the urine / stopping of urine, and for infections. A concoction of the plant is used to bathe those suffering from backache, muscle cramps, rheumatism, or swellings, by boiling the fresh stems and leaves in 2 gallons of water for 10 minutes. For painful joints of arthritis, the fresh leaves and stems are mashed and the paste spread on a cloth and applied to area, wrapped securely with a warm covering. 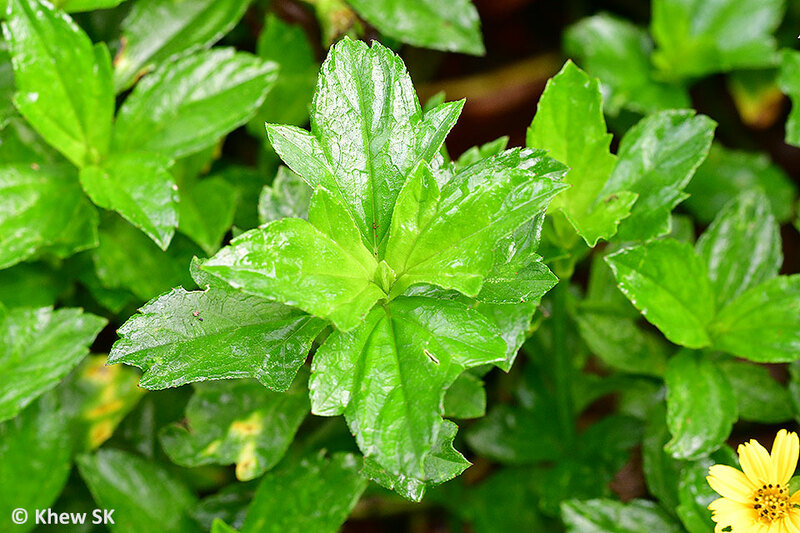 The plant extract is also used to clear the placenta after birth. 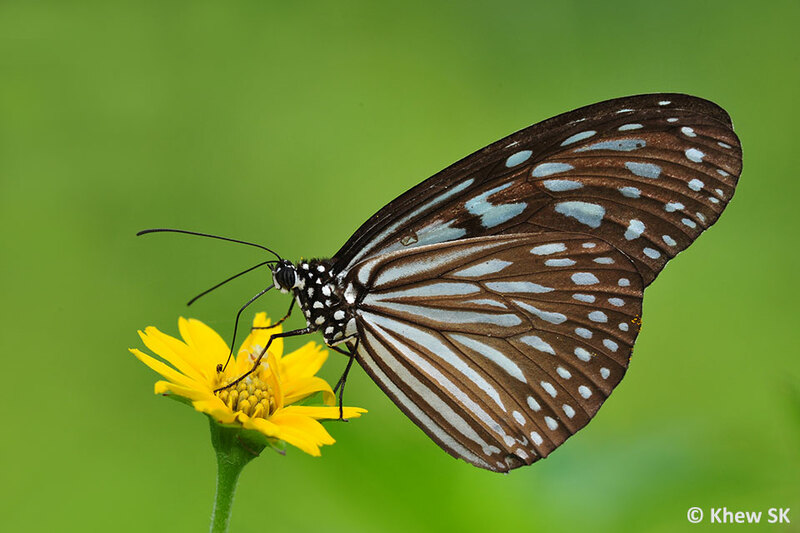 The Singapore Daisy is a butterfly nectaring plant. It is relatively attractive to certain species of butterflies and they have been observed to feed on the flowers of the Singapore Daisy from time to time. 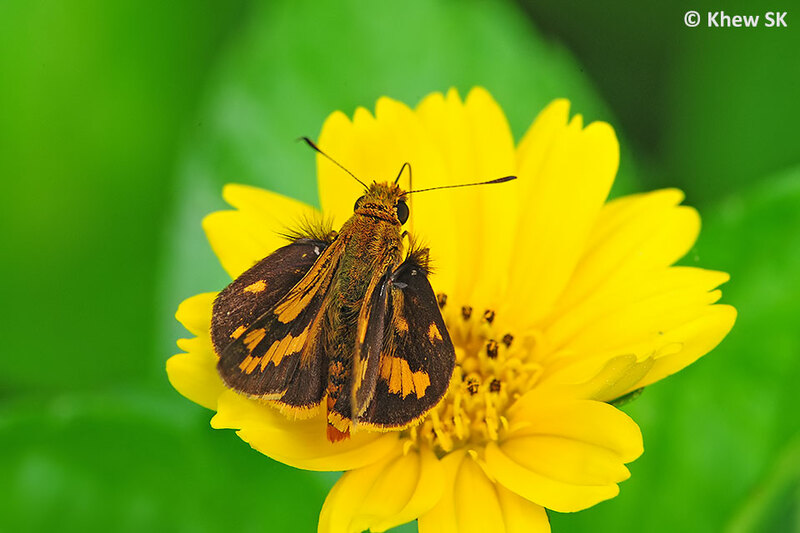 However, in the presence of other more attractive nectaring plants, the Singapore Daisy is usually less preferred by butterflies as a source of nectar. Amongst the larger butterflies, I have rarely seen the Papilionidae (Swallowtails and Birdwings) feeding on the flowers of the Singapore Daisy locally. 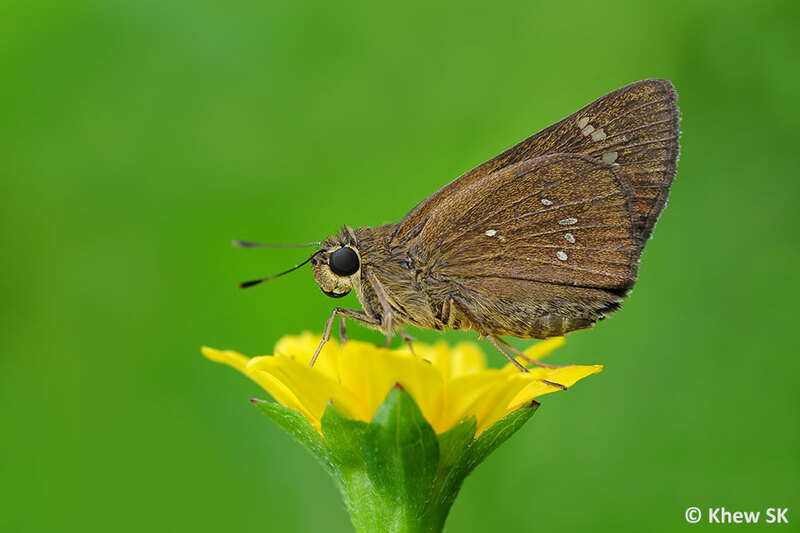 Perhaps the physical attributes of the yellow flowers do not lend themselves well to the thicker and longer proboscis of the Papilionidae? 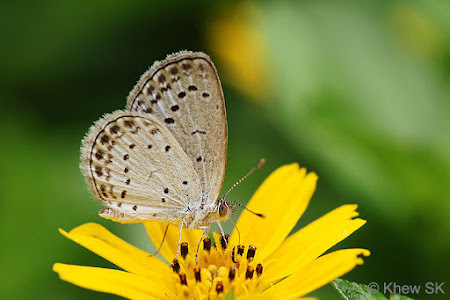 The Danainae, however, do not have any problems with these flowers and they have been often photographed feeding on the flower of the Singapore Daisy. 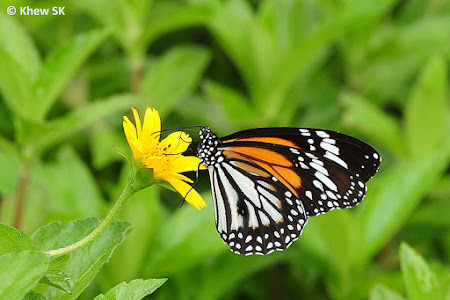 Amongst the Danainae, the Plain Tiger, Common Tiger, Black Veined Tiger, Blue Glassy Tiger have all been seen feeding on the flowers of the Singapore Daisy. 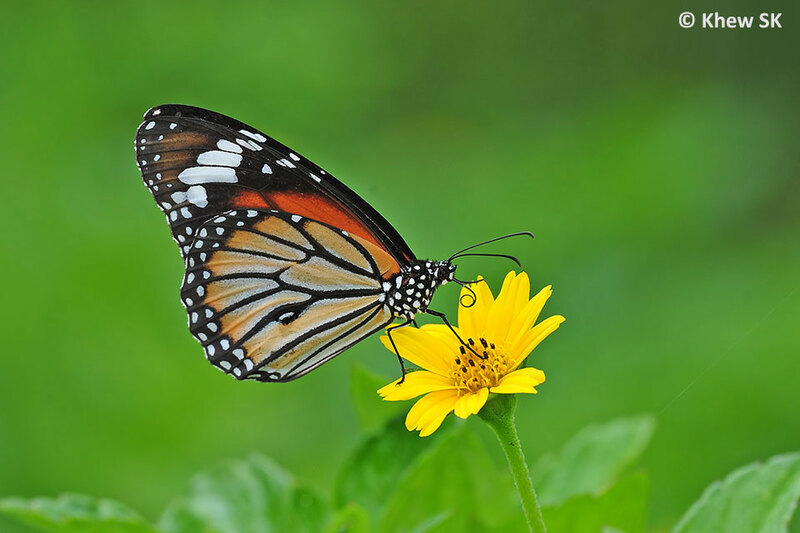 However, the flowers of the plant are usually at low level and in open areas, the the butterflies tend to be quite skittish and alert. 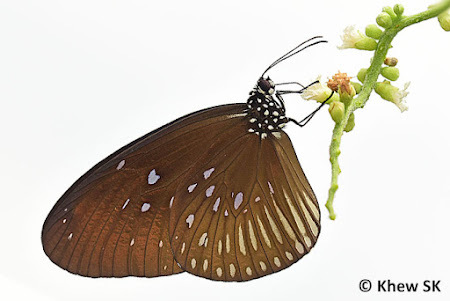 Unlike other nectaring plants' flowers, the Singapore Daisy is a low creeper and perhaps the flowers tend to leave the feeding butterflies more "exposed" and hence more alert to potential predators swooping down on them as they feed. 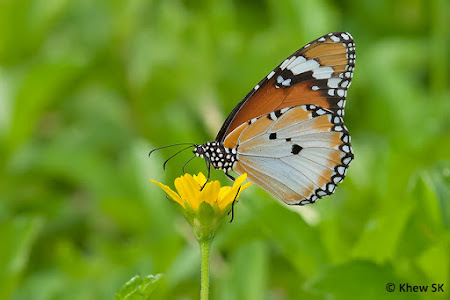 Amongst the other species in the Nymphalidae subfamily, I have observed the Blue Pansy, Chocolate Pansy, Peacock Pansy and Great Eggfly visiting the flowers of the Singapore Daisy. 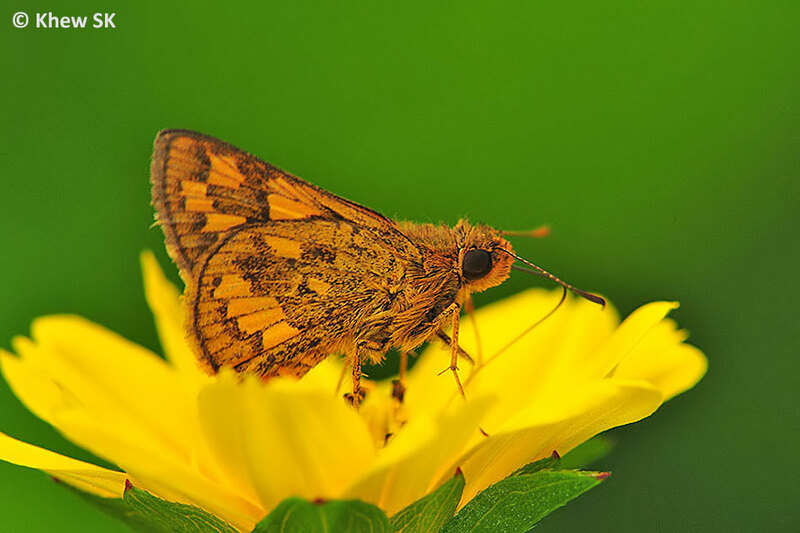 The Tawny Coster stops to feed on the flowers of the plant, but not as often as compared to other favourite nectaring plants like the Snakeweed and Spanish Needle flowers. 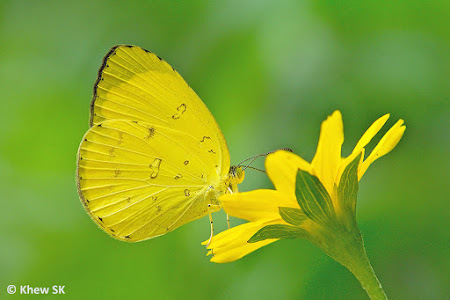 Amongst the Pieridae, I have observed some Grass Yellows (Eurema spp) feeding on the flower. 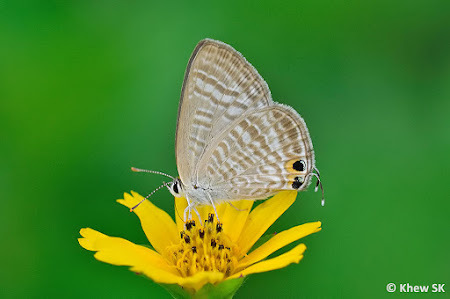 There are probably more Lycaenidae that feeds on the Singapore Daisy flowers than have been observed and photographed. 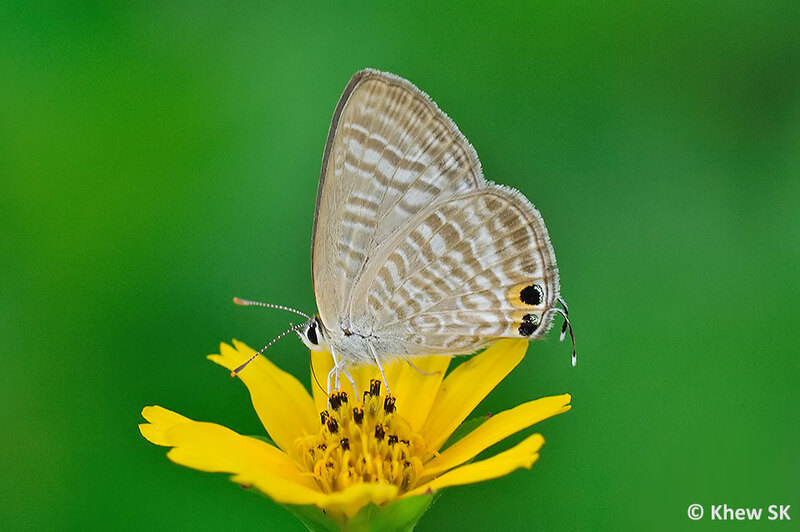 Some examples are the Pea Blue, Pale Grass Blue, Silver Forget-Me-Not and Cycad Blue, just to name a few. Again, these butterflies tend to choose other nectaring plants where available, and they only feed on the Singapore Daisy flowers when their other preferred nectaring sources are unavailable. The Hesperiidae (Skippers) are also seen on the Singapore Daisy flowers, particularly in the early morning hours. Amongst the Skippers, the Lesser Dart, Yellow Grass Dart, Contiguous Swift, Conjoined Swift and Paintbrush Swift have been seen feeding on the flower of the plant. 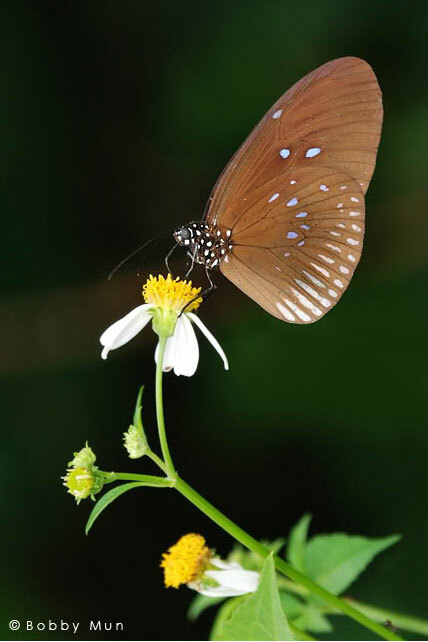 As a nectaring plant, the Singapore Daisy can be considered reasonably attractive to certain species of butterflies. 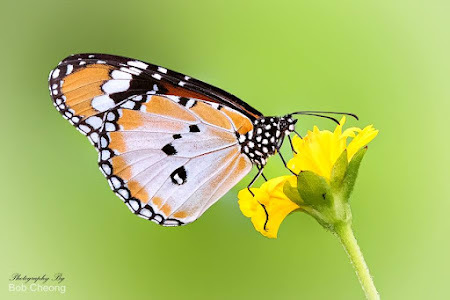 However it is not universally a preferred source of nectar for butterflies, even though there are enough photos as evidence that butterflies do feed on the flowers of the plant. As part of the landscaping horticultural palette of plants that make up a butterfly garden, the Singapore Daisy also plays its part to attract butterflies to our butterfly-friendly environments in Singapore. 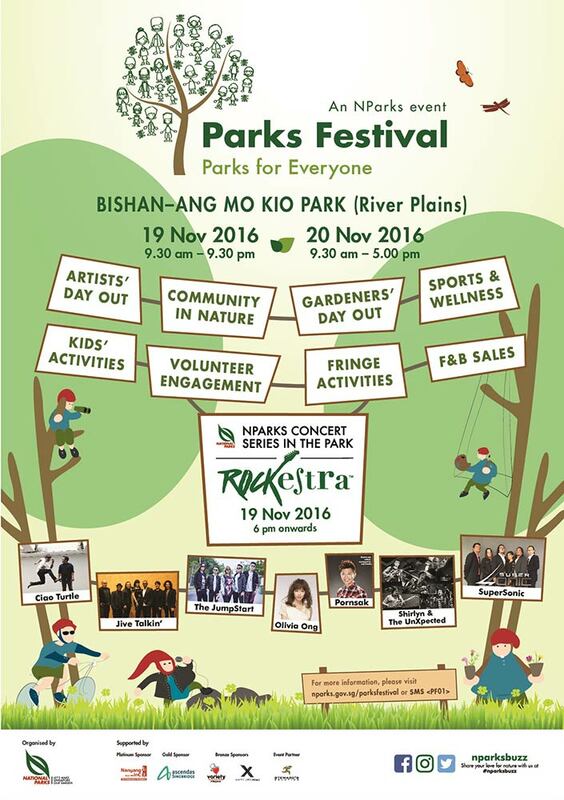 All too soon, we are now in the 2nd last month of 2016. 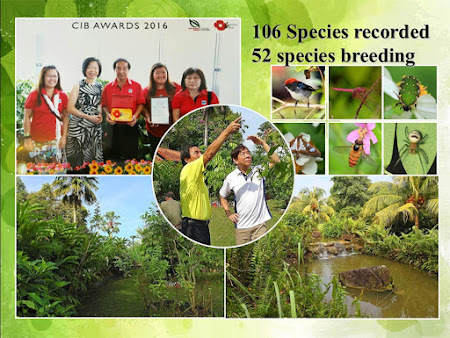 It has been an eventful year indeed, and no one can doubt that. 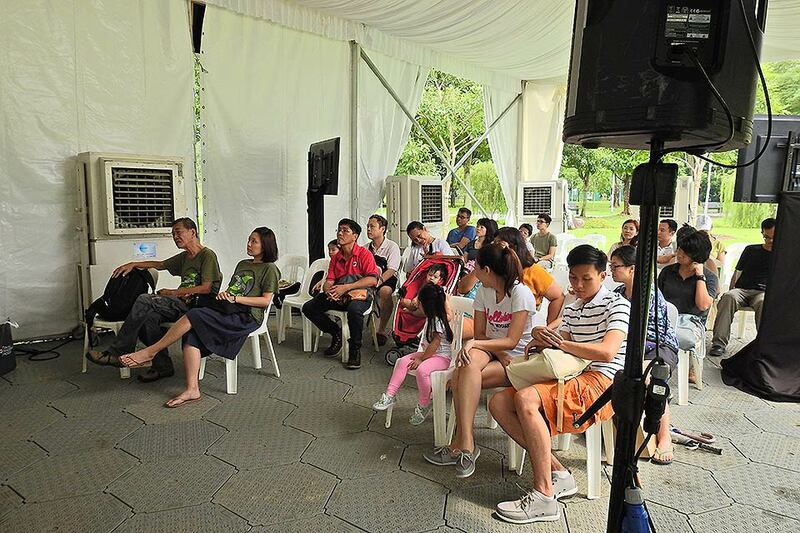 The number of disruptive incidents internationally, from China to the US; Britain to the Philippines, took the world by storm, as each bit of news ended up with a conclusion that often defies the norm. 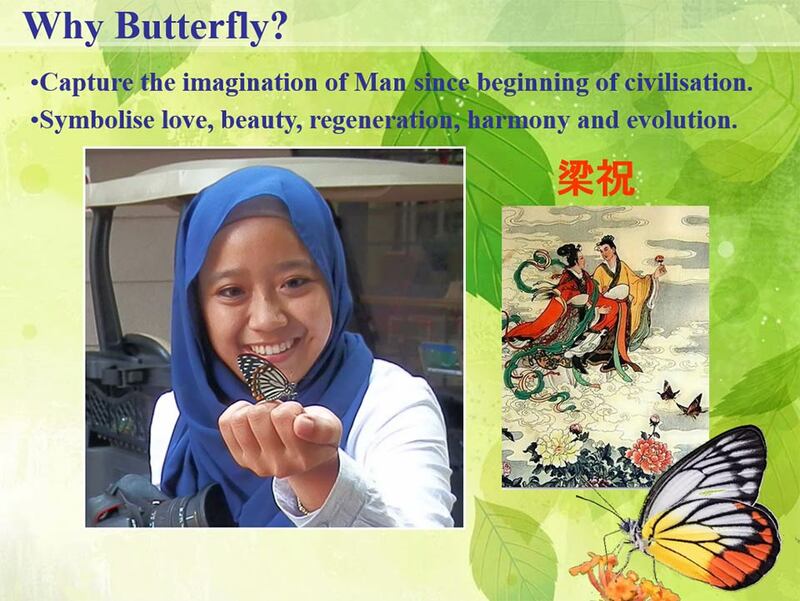 One wonders at the frenetic pace of change that our world is facing. Is stability no longer the watch word? Not many believed that Britain would leave the European Union in June this year, when the country voted on the referendum. But it did. 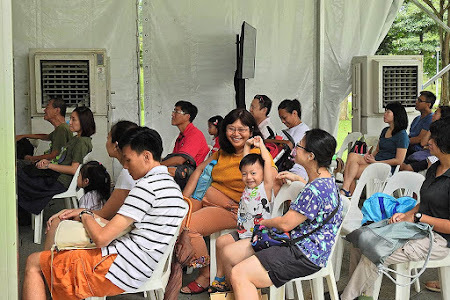 No one could believe that the Philippines would start to turn its back on the US - its long-time ally since World War II. But it did. Few believed that Republican candidate Donald Trump would become the 45th President of the United States of America. But he did. Indeed a year of unprecedented disruptive events. 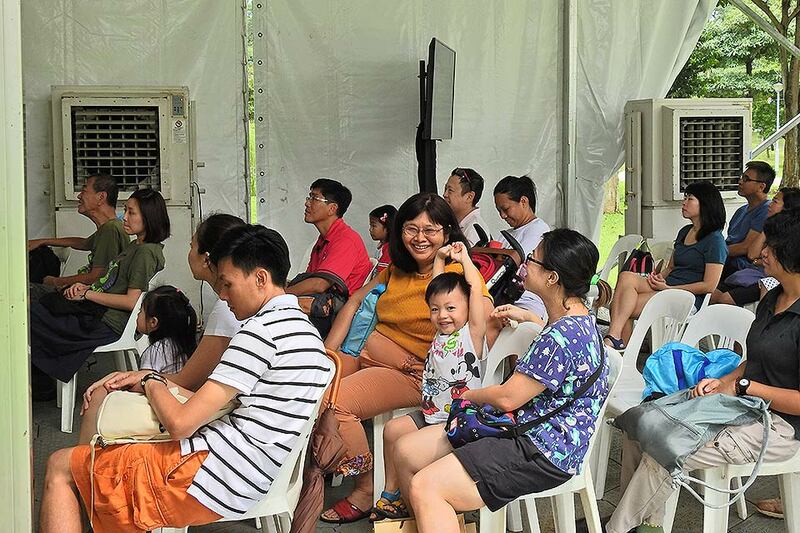 Defying expectations and norms. Is the world looking for drastic changes and thirsting for a new norm? Even news on extremists and terrorism had to take backstage to the strange tumultuous events that unfold in the democratic world. Will autocratic and authoritative leadership styles come back in fashion? And if we thought that "cash is king" in today's world, Indian Prime Minister Narendra Modi just put that notion to rest. If you were holding 500 and 1,000 Indian rupee notes, they have become worthless overnight! Modi had announced the bank notes would be withdrawn from the financial system overnight in an effort to crack down on corruption and illegal cash holdings. And for overseas holders of such notes, you will have to make your way to banks in India to exchange them for the new notes. Back to our Butterfly of the Month for November 2016, we feature one of the drab-coloured "Crow" butterflies, the Striped Black Crow (Euploea eyndhovii gardineri). If we take a look at the recommended English common name for this species, it should be referred to as the Lesser Striped Black Crow, as there is a larger species, Euploea doubledayi evalida that flies in Malaysia and Thailand, laying claim to the name Striped Black Crow. 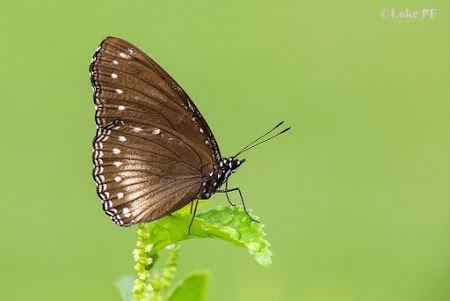 However, given that the larger Euploea doubledayi does not fly in Singapore and is less common than Euploea eyndhovii even in Malaysia and Thailand, it is likely that the name Striped Black Crow will be, by common usage, be more often used for the latter species. 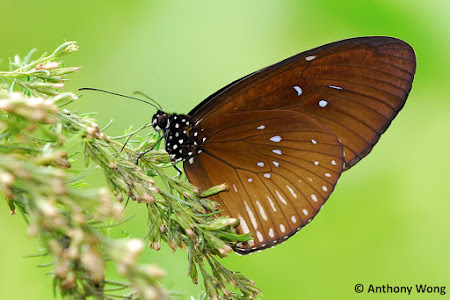 Or perhaps the name Greater Striped Black Crow be eventually the name more regularly used for Euploea doubledayi. 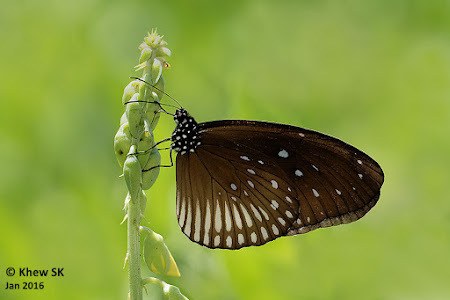 The Striped Black Crow (Euploea eyndhovii gardineri) can be considered rare and when observed, usually seen singly, mostly feeding at flowering plants. 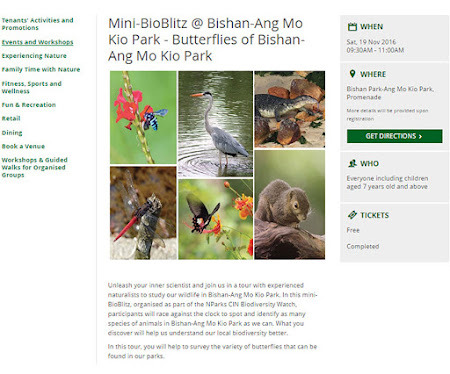 At times, it can be seen flying at tree top level in the nature reserves and forested areas. 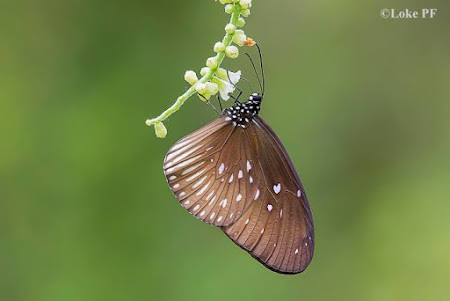 It flies with a slow gliding and unhurried flight, unless alarmed. The Striped Black Crow has velvety dark brown wings on the upperside, with the forewing usually unmarked. 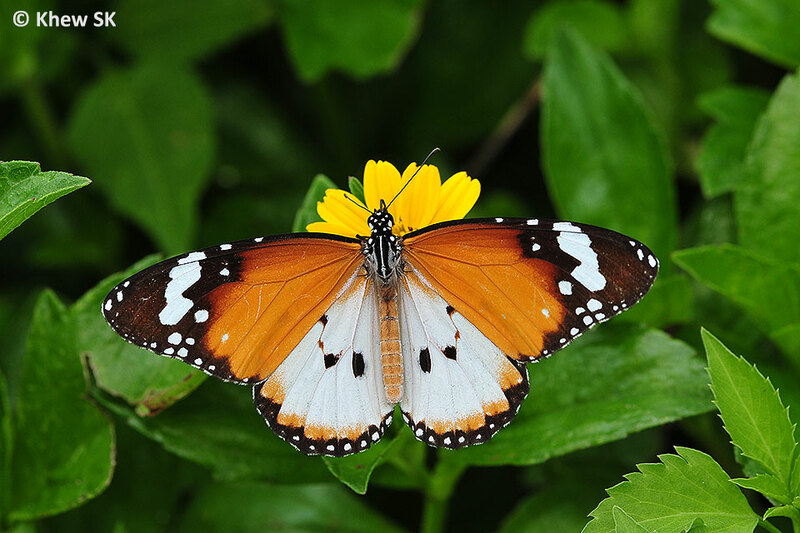 The hindwing has a series of white submarginal spots and a corresponding row of white submarginal streaks. The underside is lighter brown and has a series of spots at the discal area of both wings, besides the stripes on the hindwing, of which its common name aptly describes the species. The dorsum of the forewing is curved in the male but straight in the paler female. The males have a dark brand on the forewing. 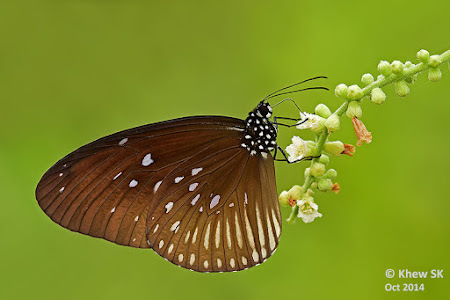 The thorax is spotted with white in the usual Danainae fashion, and like all Nymphalidae, only four legs are fully developed and used for walking and holding on to perches. 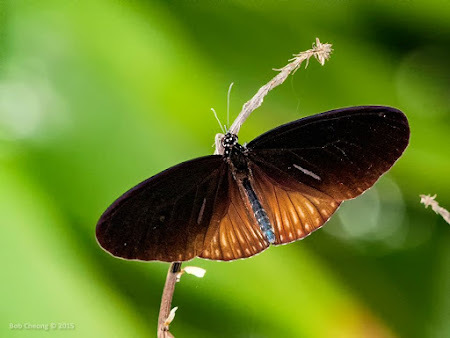 If handled, the male Striped Black Crow extrudes a pair of yellow hair pencils. These hair pencils are pheromone-signalling structures often present in male Danainae butterflies. 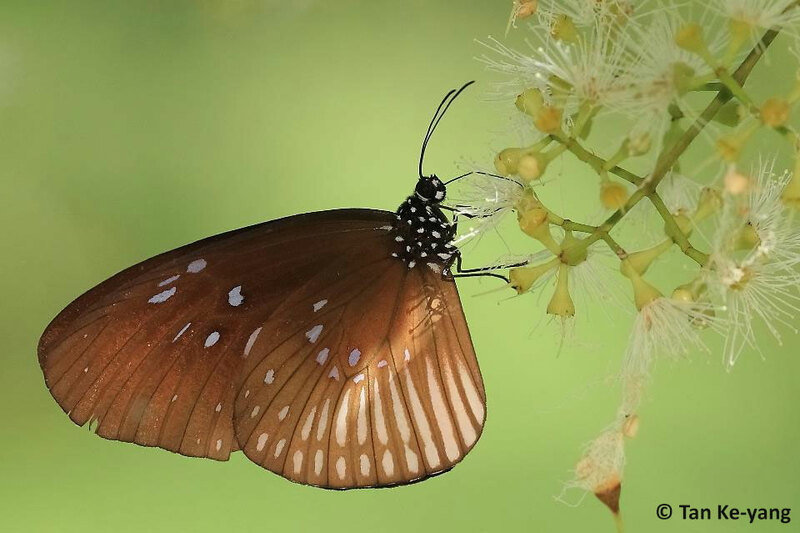 Males Danainaes use hair-pencils in courtship behaviours with females. 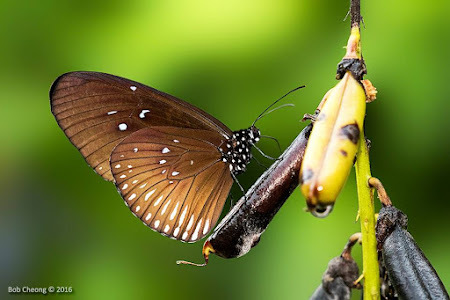 The pheromones excreted by the hair-pencils serve as both aphrodisiacs and tranquilizers to females as well as repellents to conspecific males. 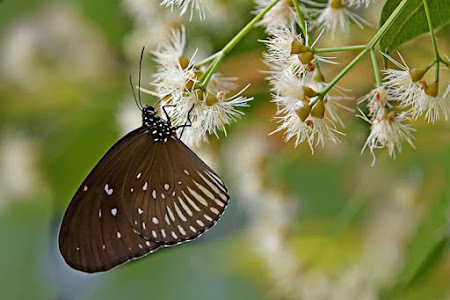 The Striped Black Crow can be found in the forested nature reserves of Singapore, often appearing when there are flowering Syzygium trees along the forest fringes. 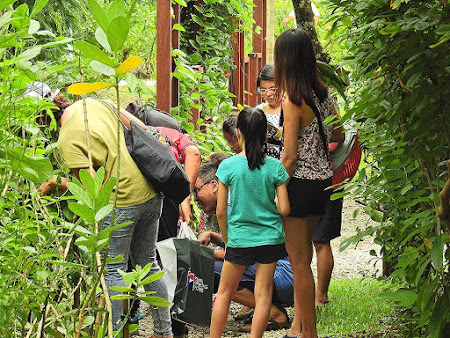 It is most regularly seen on the offshore island of Pulau Ubin, coming down to feed on the flowers of shrubs like the String Bush and Bandicoot Berry. It is attracted to the dried leaves and seed pods of the Rattleweed like many species of Danainae. The Malayan Eggfly (Hypolimnas anomala anomala) form-nivas, a species from the Nymphalinae subfamily, is a very good mimic of the Striped Black Crow. 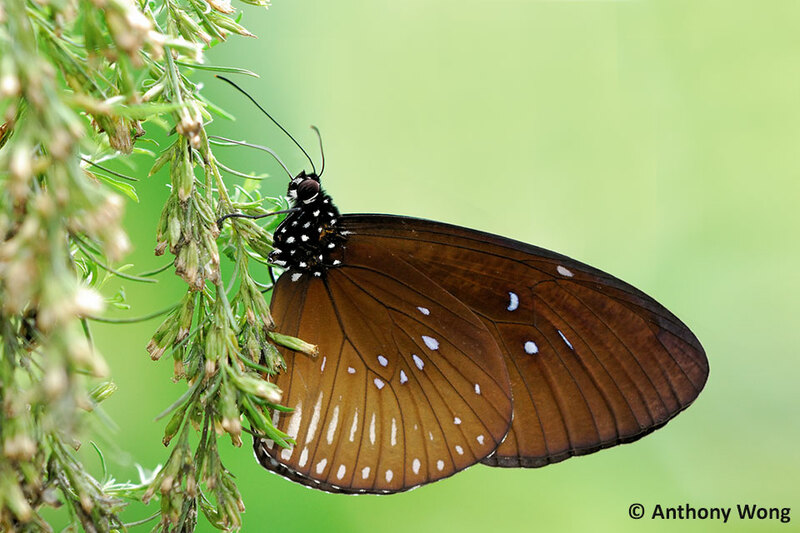 The white stripes on the hindwing and brown colour of the Malayan Eggfly allows it to mimic the distasteful Striped Black Crow for protection against predators. Hence many beginner butterfly watchers have confused the Malayan Eggfly with the Striped Black Crow.